Please Note: Unfortunately, the Kate Chopin House (Alexis Cloutier House) was recently destroyed. We have retained this page as a source of historical information. 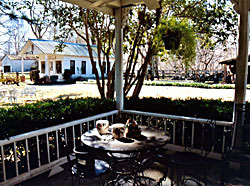 The Kate Chopin House was the Cane River home of author Kate Chopin and her husband Oscar. Her experiences here led her to record the history, folklore, and lifestyles of the people of the Cane River area. After living in St. Louis and New Orleans, the couple moved to Cloutierville in 1879. Oscar purchased this house as well as some land and opened a small plantation and a general store. He proved to be a poor businessman and quickly found himself in debt. In 1882, Oscar suffered from malaria and died later that year after he was administered an overdose of quinine. Kate took over the business and was able to pay off the family’s debt in 15 months. However, Kate decided to give up the business and return to St. Louis when rumors spread that she had been having an affair with a local planter. Her time in Cloutierville provided inspiration for her two novels, At Fault and The Awakening, as well as for many of her short stories, including those in her collection Bayou Folk. The house was originally built by Alexis Cloutier in the early 1800s. At that time he owned much of the land that today makes up the town of Cloutierville. He attracted settlers to the area and, in 1816, donated land to erect a church. In 1822, Alex Cloutier founded the village of Cloutierville. Shortly thereafter, he petitioned to split Natchitoches Parish in two and have his village be the new county seat. His petition was denied and, frustrated, Cloutier left the area never to return. 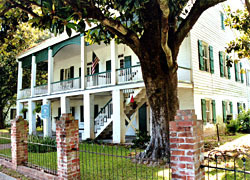 The Kate Chopin House currently serves as the Bayou Folk Museum. It is owned and operated by the Association for the Preservation of Historic Natchitoches, a non-profit organization. This simple two-story French Creole cottage houses furniture and artifacts from the various eras of the region’s past. The museum recently expanded its Kate Chopin exhibit to better tell the story of Cloutierville’s most famous citizen. Three buildings have been added to the property since it was converted into a museum, including a doctor’s office, a blacksmith shop and modern bathrooms. The Kate Chopin House, a National Historic Landmark, was located at 243 Hwy. 495 in Cloutierville, 25 miles south of Natchitoches but recently burned down. The Kate Chopin House has also been documented by the Historic American Buildings Survey.